Many of us have become accustomed to the limitless choice on offer at supermarkets. However, at Infinity it is seasonality that accounts for the ever-changing variety in what we offer on our vegetable shelves. This in turn offers a rich and varied re-discovery of new fruits and vegetables on each visit to the shop. 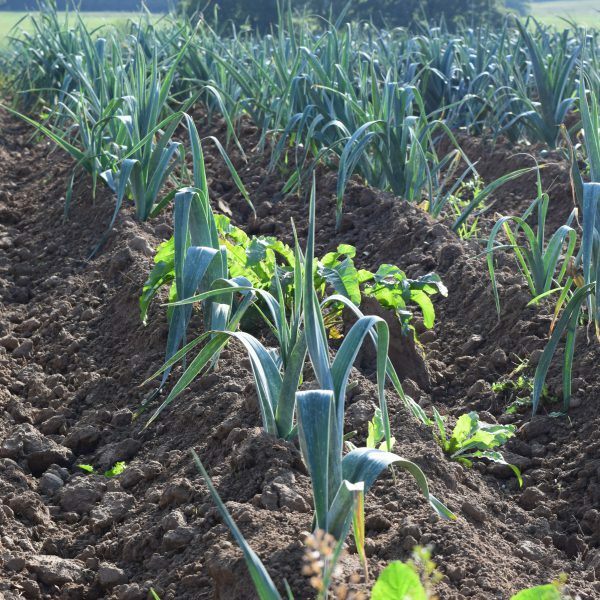 Laines Organic Farm is one of our longest standing suppliers and has been providing us with organic, seasonal fruit and vegetables from their farm at Cuckfield since 1979. Situated just south of the village, the fields offer beautiful, clear views over the South Downs. On the hottest day of the year, in mid-September, we were lucky enough to visit. When Britain joined the EU in 1973, Toos Jeuken’s father, himself a child of farmers, came over from Holland looking to buy land to farm. Realising the amazing quality of the soil, he bought 100 acres and began a new life in West Sussex. Five years later in 1978 his daughter Toos, aged just 22 (and one of 8 farming siblings), travelled on her bicycle from Holland and rented a little farm workers cottage and about 7.5 acres from her father. In the beginning, she grew sweetcorn, kale, red and white cabbage, carrots, potatoes, onions and leeks. A year later one of Infinity’s founders, Robin Bines went to Laines farm and asked Toos to grow Hokkaido squash as it was very rich in calcium (good for veggies!). We have been buying Toos’ veg ever since. So what is it like to be an organic and biodynamic farmer in 2016? I ask Toos how many employees she has. Just her, and Roger, who likes to do the tractor work she tells me. Her daughter Rosa, 24, has also been working on the farm full time for the past year. So just those three. It takes me all day for this to sink in. They do have Wwoofers and volunteers to help with the harvesting and other jobs throughout the year but still. Toos is 60, and quite the happiest and warmest person I’ve ever met. She tells me she loves her job, can still do it, and has no plans or desire to retire. She also laughs there are antidepressant qualities in the soil and I can well believe her as my face aches from constantly smiling the whole morning I spent there. I ask about the work involved in protecting and nurturing the crops, and the daily tasks of farming – how does she water, feed and protect her crops? Although the farm’s hilltop aspect presents a challenging growing environment, it is not entirely without good fortune – pest control is largely taken care of by the westerly wind. There’s a constant battle against weeds, although ‘battle’ is not a word that seems appropriate for Toos’ style of farming. Harmony would be the most suitable, as she works very much with nature and farms using Maria Thum’s biodynamic calendar to guide her. She has learned to accept the bindweed, and says now they are friends! Feeling the 28 degree heat, I ask her whether she also waters her crops by hand or if she has an irrigation system. No, she never waters. “I work with nature” she says, simply. Neither does she bother with fertiliser, just mulching with manure by hand from the back of a tractor to restore nutrients to the soil after harvesting. Toos grows all of her crops outside with the judicious use of horticultural fleece providing protection from bird damage. The fleeces are carefully put in place by hand and thus last for about 10 years as opposed to what can happen on conventional farms, where mechanisation of the same process usually results in frequent tears and the consequential rapid turnover and disposal of fleeces. This method of all-outdoor growing is not just a reflection of resourcefulness – all the crops bear the wind, rain and full sun of the seasons, resulting in a stronger more rich flavour, and hardy crop. Following a tea break with the Wwoofers and making friends for life with one of their cats, Kitty New, we continue the tour. We reach what’s known as ‘the hilly field’ and see a large pumpkin patch. They tell me the crop has been a bit disappointing this year. Although, there are some impressively plump specimens ripening in one corner. The compost heap, Rosa points out. These ones have self-seeded from rotten ones thrown there last year! I ask Toos what differences she notices in farming now compared to 38 years ago when she started. She says the growing conditions have not really changed, she still uses the same cultivating techniques as 40 years ago, always working with the weather, not against it. Nowadays she farms 4 fields, the largest her farm has ever been, and her sister Bejatrix also farms and runs the small farm shop, making their huge array of produce available to the villagers. She says the soil is still in very good condition and she puts a lot of effort into keeping it healthy and well balanced. She also comments that kale has become extremely popular in the last ten years, coincidentally the same time she started doing farmers markets around Lewes and Brighton. Over the years she has tried to avoid using plastic packaging materials, and always wears elastic bands around her wrists, used for bunching up veg. There are also wooden crates piled up in every field for convenient harvesting. Because her customers like Infinity Foods always return these crates for use again and again, she predicts some of them maybe several decades old. Wwoofers, students and volunteers come from all over the world to help in the busy summer and autumn months, and on the day we visited, the onion harvest was in full swing, with sacks of onions everywhere, and piles still sunbathing in the fields to dry them off. Her aim is now as it ever was to keep the soil in good condition through organic and biodynamic practices. The autumn and winter crops stay in the field and are picked when ready or needed. Rosa tells me that her Grandfather farmed organically, then used chemicals after the ‘revolution’ caused by developments in farming with them, then back to organic. She explains “he went back to natural methods because, well mainly the soil. He went back because he realised that the health of the soil is EVERYTHING. It’s number one. He saw with the artificial fertilisers the soil is quickly depleted, leaving no food for the plants or animals living from it. The soil life is not in balance if it’s fed artificially (with chemicals as opposed to green or animal manure). He saw that the plants would grow healthier and stronger if the soil is in good condition”. Picking up a handful – known as Horsham Green Sand – I can see this wonderful loose, sandy top layer reveals a dark moisture retaining structure underneath and it’s no surprise the abundance and variety that it yields decade after decade.